One more Pro Tour is in the books, and this time it was taken down by a long deserving grinder, Gerry Thompson. I’ve met Gerry a few times and he’s always been amicable and receptive, including in social media interactions, where I would frequently pester him about updating his Modern brews. There are few other players that I personally would root for. Congratulations Gerry! Two major storylines developed from the event; that Aetherworks Marvel is back in force, and Zombies are the real deal. Gerry took down the entire event with a Mono-Black zombie build, and there were two other Zombies lists in the top eight as well. Meanwhile a full half of Sunday was Temur Marvelworks. Looking at the best performing decks, rather than the top 8, provides a similar set of data. Zombies and Marvelworks were a huge part of the 24+ point Standard decks. Only 4 of the 14 best decks, less than 30%, were not one of those two archetypes. It’s unlikely Standard will resolve into a two-deck format over the coming weeks, but make no mistake, both Marvelworks and Zombies will be tier one lists for awhile. Expect Mardu Vehicles to still show up on the local circuit alongside these two for a few weeks. Vehicles may not have had an excellent conversion rate, but it’s still a strong deck, and many players at your store will be too invested to audible to a new strategy. We may also see Zombies behave the same way Spirits did at Pro Tour Dark Ascension several years ago. 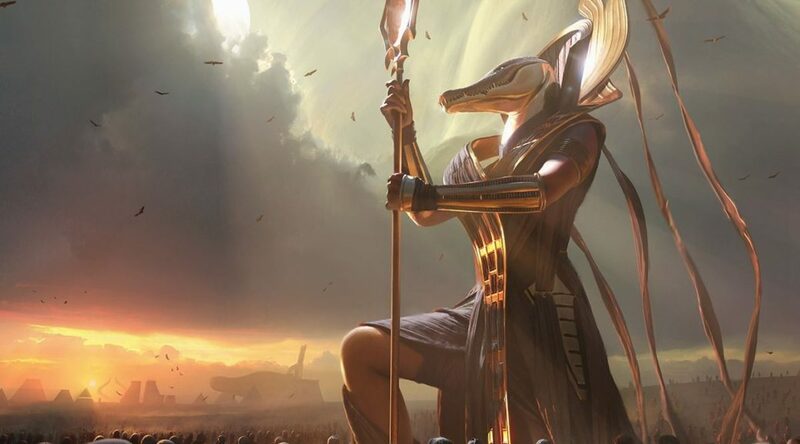 It was a dominant tribal strategy at the Pro Tour, but once it was out in the world, it folded too hard to dedicate hate, and fell off the map. Zombies is likely better positioned than Spirits was, but a Swelting Suns and one or two pointed pieces of exile goes a long ways towards completely defanging the strategy. While Rhonas has been the most discussed Amon…khetian? god, and Hazoret the Pervert the second most, it’s Bontu that I’m looking at today. Bontu the Glorified is the black god, and while he isn’t as obviously powerful as the Gruul pair, he’s certainly capable, and possibly quite underrated. This weekend saw Bontu in the Cryptolith Rites decks as a way to filter away chaff and keep pressure up with a strong attacker. I expect Rites decks to continue to hang out in Standard at the fringes until October when Shadows Over Innistrad rotates, but Bontu’s price shouldn’t be driven hard by this. I see his presence in the Cryptolith decks as a proving grounds; a message that yes, there’s definitely ways to make this guy work. Come October he won’t be in Cryptolith decks, but that doesn’t mean he won’t find a home elsewhere. My first thought is in the freshly baked Zombies deck that did so well this weekend. In order to transition from a Pro Tour deck to a tier one Standard deck, Zombies is going to need the ability to go a little larger, increase resiliency, and find a way to finish a game after a late sweeper. Bontu sets up all of these. As a menacing indestructible 4/6, he’s capable of putting real pressure on the opponent with impunity, and will occasionally be stone unblockable. Zombies is a natural home for his sacrifice ability, both with the mass of tokens it generates and Dread Wanderer’s reanimation. There’s upside to that as well; with the ability to set up larger Diregraf Colossus’, or trigger Relentless Deads as a means of reanimating other bodies or simply putting a zombie back into your hand to cast for more Colossus triggers. More generally, Bontu provide two other functions that aggressive decks are going to be happy with. Sacrificing dudes provides both card selection via the scry, helping to avoid excess land drops later in the game, and reach, as a way to close out the last couple of points after an opponent has clogged up the board. Bontu’s price is hovering just north of $4, and is likely to depreciate over coming months as Standard, and Magic in general, take a back seat to pleasant weather activities and college gaming groups on recess. The next few months will be a great time to pick up Bontu, and anything else you’ve had your eye on, ahead of the fall surge. Probably two months ago I discussed this over on MTG Fast Finance, and it’s still a great card to keep your eye on today. In fact this has become even more true with all of the Commander 2016 buyouts that have been occurring lately. Within the last two weeks we’ve seen Breya, Conquerer’s Flail, Bruse Tarl (ongoing), and Duelist’s Heritage, to name a few. There are less than 30 NM copies of Crystalline Crawler on TCG Player right now, and at least two sets of those are around $8 each. I don’t feel like I need to spend much energy explaining the card, so I’ll hit the highlights. It’s fantastic in Atraxa, the most-built EDH deck on edhrec.com. It’s excellent in Breya, the second-most built deck. It loves counter manipulation strategies, and as such has a high synergy with Doubling Season, perhaps the most visible EDH card period. It’s simply a dang good card in EDH. There are still copies floating around in the $3 range, but those don’t have long for this world. A solid double up towards $7 to $8 is basically a foregone conclusion, and I’d say that prices between $10 and $15 are completely plausible within the year, if not the next month or two. Blowfly Infestation. Dusk Urchins. Flourishing Defenses. Crumbling Ashes. Seshiro the Anointed. Hapatra, Vizier of Poisons has made a surprising number of cards spike in value recently. Necroskitter is the next poised to fall. Hapatra is a deck all about -1/-1 counters, and as such, Shadowmoor and Eventide have been rich veins both for deck builders and speculators alike. The former appreciate the number of synergy cards from the mini block, and the latter appreciate how few copies there are of said synergy cards. I’d wager at this point that the only reason Necroskitter isn’t $10 is because it was (semi) recently reprinted in Modern Masters 2015, giving it a bump in supply that most of the block hasn’t seen. Supply is low across both sets though, and Necroskitter is perhaps about as good a payoff as one can get in a deck that specialises in A. putting -1/-1 counters on creatures and B. destroying creatures with -1/-1 counters. We’re well past the point of “it’s too early for MM2 cards to spike,” so I don’t expect that to prevent a shift upward on Necroskitter, rather, it will simply delay it by a few weeks. As a must-of in all Hapatra decks from here out, I’d expect Necroskitter to land comfortably in the $5 to $8 range, depending on how much additional traction it gets as players discover it for other decks.